Seasol for Lush Green Lawns is a liquid fertiliser and health treatment for all types of lawn. Promotes healthy growth and enhances foliage colour. Stimulates strong healthy root development and beneficial soil micro-organisms. Reduces stress from heat, drought, frost and foot traffic. Conditions the soil, increases soil friability and reduces nutrient leaching. Gets water to where your lawn needs it most, the root system. 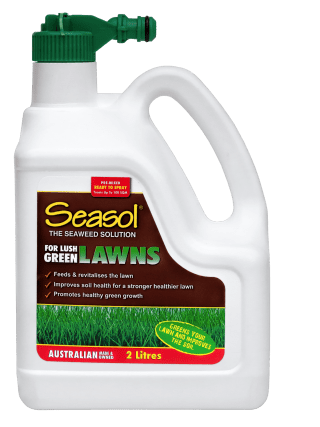 Seasol for Lush Green Lawns is a superior health treatment and liquid fertiliser that combines the benefits of Seasol seaweed solution, a specially formulated nutrient mix, trace elements, concentrated liquid composts and a wetting agent. It feeds and revitalises your lawn, but also conditions the soil, which means you are taking care of your lawn above and below the ground. The added wetting agent makes sure that valuable water and nutrients can penetrate the root system, so it’s the perfect pick me up for a healthy lawn all year round. It’s a fast-acting soluble formulation, so you’ll see results in no time. This solution is formulated for hose end application. Shake Well. Remove pins from top of spray nozzle. Attach hose connector and turn on tap at low to medium pressure. If required it can be diluted for watering can use at the rate of 100 mL per 9L of water. Regular fortnightly or monthly applications will promote a healthy, lush green lawn.